I met her when I was still in the Navy. She was an interesting bird. Not the easiest to get along with, but I was still enthralled by her charms. I learned to get to know her better. Learned her name, learned that she was from Japan but had some European roots, learned that she enjoyed men who knew her style, and could be more cerebral. I grew with her. She grew with me. As I learned her better, I grew to love her. But life changes. Things change. And she didn’t want to change with the times. She was like a housewife, comfortable in her niche. I’m ashamed to admit it, but I ended up finding someone new a few years ago. Someone fresher, someone who was more applicable to where I was in life, and where the world around her was. What’s sad is that while I was cavorting around with the new one, the old one was trying to get me back. She would come back to me every year. “I changed! I look better now! Please take me back…”. Maybe I was heartless, but I would give her a cursory glance before patting her on the head, telling her it was over, and going back to my new woman. She had money, and status, and came from a good family. It was the right move for the time. But while I was with the new chick, I kept thinking back to days gone by, and my old relationship. The new girl had a lot of things going for her, but she was a bit demanding of my time. She was clingy, and had her quirks. I started to wonder if I made a mistake. Then this year, she came back. She let me know that she realized she’d made mistakes, and that we’d grown apart, but please… just this one time… give me a shot. Let me try to woo you. I gave her a shot, because I was growing tired of the new girl and her enigmatic ways and dogged stubbornness. She wanted me to let others into our lives, sometimes as many as twenty other people at once, when I just wanted to be alone with her. I gave the old girl a shot again, and remembered why I loved her. She had changed, but really, she hadn’t changed. It’s funny how these things work; her greatest weakness was simultaneously her greatest strength. And as I sat there, enjoying splendours of the night that were all too familiar to me through years of repetition that were also spiced with some new tricks she’d learned, I felt bad for ever leaving her in the first place, yet thankful that she would take me back, as disloyal and easy to sway as I had been. That girl is Pro Evolution Soccer. And man, it’s good to be back with her. Don’t get me wrong. FIFA isn’t bad; in fact, it’s very good. But Pro Evolution is my woman, and she’s who I belong with. Despite a few issues that never really went away, they’re familiar issues. I’m glad to have her back. Thankfully, Mohamed Al-Saadoon doesn’t mind sharing – he’s pretty liberal for a Saudi Arabian Muslim – as we both basically date the same chick. 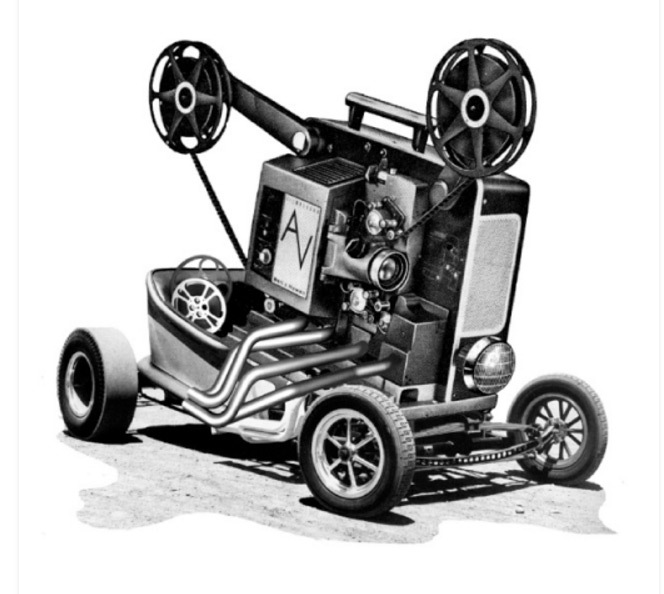 Therefore, I’ll spoil my review in saying I generally agree with M.A.S., save some minor details. Most of what people will see in this game are things people have seen before. The same big modes (Master League, Be a Legend) are back, and in addition to the UEFA Champion’s League, they added the South American equivalent, the Copa Santander. It’s nice to play with, but ultimately, most of a player’s time is going to be spent between the two big modes: Master League and Be a Legend. Both of these modes have seen some notable improvements. It doesn’t seem at first like much changed in the Master League, but the key is in the subtle changes. As Mohamed mentioned in his own review, the biggest change is the way training is done. Before, if you wanted someone to learn a new position or a new move, that was the only thing they could train on. Now, depending on the size of your club and the abilities of your staff, you have a variable amount of training points to distribute to training either your whole team, or your players individually. Depending on whether your player’s peak is about to come or has already passed, they have different levels of gaining experience, based on their training, though I notice it’s slower than in previous versions. Also, the way coaches are graded is different in some cases. For scouts and assistant coaches, there are a lot of different strengths and weaknesses they bring to the table, so paying the most money isn’t always the best way to get the most out of what you want. Those changes are relatively small, but make a big difference overall in how your team grows over the years. Other than that, Master League is still the same, for better or worse. It’s mostly for better; the bad things (you can’t change teams or be fired, and the only way to “lose” is to run out of money) are outweighed by the good (the mode is solid, AI is good, and there are a lot of nice options for building your team up). If you were a big Master League player in the past, this mode will suit you just fine. The other big mode is Be A Legend. Last year’s mode was crap on a stick, but they made a playable mode this time around. You’re given the choice of which low-level team you want to start out with, with varying salaries, team ranks, and styles of play depending on what team you pick. The last bit is important, because your coach, depending on the team’s style of play, will give your team specific instructions based on that style. For example, sometimes, you’ll be told to play the ball to a certain side of the field or to a certain player, and other times, you’ll be told to defend more, or mark a specific player. This is less important if you’re a striker (where anything you do wrong will be overridden if you score, more or less) than if you play in the midfield or on the back line, but if you don’t follow your coach’s orders, you risk being removed from the first team and possibly being transfer listed. As mentioned, you actually get a salary, which helps you eventually get better agents with better connections, more access to training points, generally more of everything. I agree with The Notorious M.A.S. that it’d be nice to actually spend that money on something else other than an agent, but as it stands, it works out well to at least have something to look forward to. The structure of Be a Legend mode is nice, but the controls and camera need some work. There’s a button to draw back the camera to see the entire field, where a more useful command could have gone. If you don’t use this, you can’t see the whole field, but it draws back so far, it might as well be the blimp camera from Joe Montana’s Sports Talk Football (eight people just went “wow!” in remembrance, and everyone else just went “huh?”). To call for a pass, you have to press RT twice, which doesn’t feel natural at all, and usually doesn’t even result in actually receiving a pass, as your teammates are very good at completely ignoring what you want to do. There’s also no feedback as to how you’re doing, though that could be a good thing. FIFA had a big habit of punishing people for being slightly out of position, or having shots blocked. In PES, you’re only graded at the end, which helps me concentrate on dropping back and helping out the midfield, and allows me to worry about bombing away without it hurting my arbitrary game rating. Overall, I still rate Be a Player below FIFA’s Be a Pro modes, but only slightly, and it’s a case of personal preference. That definitely wasn’t the case last year, so good on Konami for addressing the problem. 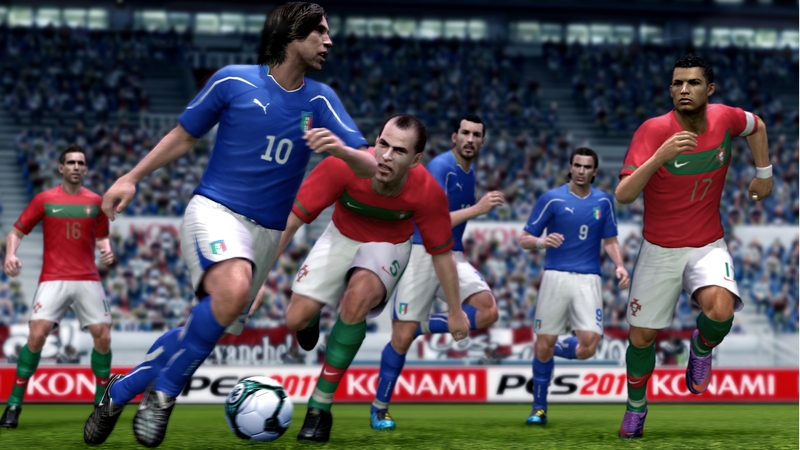 Everything else is bog standard for a PES game, but the two big modes are there, and for most fans, the only thing that matters is the thing that got them into Pro Evolution in the first place: how does the game play? I can’t FULLY say that the king – or in this case, my girl – is back, because there’s some baggage here, but it’s finally worth playing the game again. That said, there is going to be a massive learning curve for even veterans. While FIFA was making a big deal out of PRO PASSING~ (ie: “we nerfed blind passes along the ground”), Konami was busy revolutionizing passing as we know it. Mohamed described it in his review as a “strange hybrid of manual and semi-automatic passing”, and I think that description is apropos. Now, instead of passing to a player, it’s smarter to pass to an area, and let your players run onto the ball. This is going to mess up veterans of both PES and FIFA, who are used to directing passes at people and letting the game take care of the rest, and I guarantee anyone who goes into this game thinking that way is going to have a rough go of it the first few games until they get it. Once they get it, however, it’s going to become second nature, and the way it works is intuitive. Konami did well here, but I do have a beef: pressure is a little hypersensitive, and hard to get right. You could be thinking of a short touch pass, and notice that your player is inadvertently sending a bullet across the pitch. This is doubly problematic because it exposes something about the game’s AI that will creep up elsewhere: if the game thinks someone should have the ball, *ONLY* that person will go for the ball. Let’s say, in a 4-4-2, you are the LCM and want to pass to the RCM, but you get it just too strong, but not strong enough to reach the RW. In this case, your RCM will dummy the ball on and go about his business, completely ignoring the ball that your RW can’t reach. It’s a turnover, when your RCM could react (dependent on awareness ratings) to the misplaced pass and keep possession. Keep this issue in mind, it’s going to come up again, but then again, if nothing in this paragraph made sense, stop reading right now: Pro Evolution Soccer is not for you. Defence is also completely different now than in the past. First off, if you’re used to FIFA’s default control scheme, you’re screwed. This game is made for the default PES scheme, the one that’s been used since I can remember. Get used to the PES scheme if you want to have a prayer of success, and then get used to even more culture shock, because Konami changed the game on that side of the ball as well. The way defence has always been done in the past is that you have a pressure button (on the 360, A) that has the player you’re controlling apply pressure to the person with the ball, while another button (X) has a secondary man come in and help out. Used right, it’s a turnover, but used wrong, it’s a lot of open space to be exploited by a good player. This year, they added a mechanic to it: directional sensitivity. If you hold just the A button down, the defender will do a normal-pressure tackle, and make an attempt at the ball but won’t go overboard (best against players who haven’t committed one way or the other with the ball yet). Pushing forward and A will make your defender go for the ball no matter what, fouls or getting burned be damned (best used if you’re sure you’ll get the ball, or if you’re down late and need to counter), and holding back and A – by far the one I took the longest to get used to – has your player pressure the ball, but hanging back about a yard (best if you’re trying to send the man on the ball to a certain spot on the field, or – I notice – if you’re defending on the flanks with a side-back and are trying to keep a potential cross from reaching the six yard box). It’s not quite rock-paper-scissors, which is a GOOD thing; defenders have to think of the right amount of pressure to use, and react accordingly, because one thing this game has over FIFA is the fact that tackles aren’t automatic to either work or be a foul. There is a chance that you go for a tackle, catch some of the ball, and end up getting beaten anyway. I’d describe it as being “loose”, but that’s football for you. My issues are twofold: one, if you’re aggressively tackling, there’s a strong chance that your player won’t even make a tackle, and will instead try to literally run through the ball. If it works, you’re countering, but it works about 1% of the time. I noticed that in most cases, the best thing to do was to use regular pressure, or to use light pressure and have a second man come in and make the tackle anywhere in the last third of the field. Secondly, the issue I mentioned in the previous paragraph comes up again, and is even worse on defence: player selection is atrocious. The game basically decides, especially on passes and through-balls, who the best defender to get the ball is. The problem is that if the game is wrong, or I want to do something else, there’s nothing I can really do, which is doubly frustrating as I watch three defenders ignore an open ball so that my last man back can fruitlessly run towards the ball, just to get threaded on a predictable through ball to send the striker home. It’s like my team is trying to be polite to each other. “Oh no, I couldn’t! That’s your ball, mate! Can we share it over tea time? That’d be delightful!”, when I’m screaming “ball, ball, BALL, &%#@ING BAALLLLLLLLLLLLLLLLLLLL!”. This is something that I would request Konami patch ASAP. There are a few other issues with gameplay. In-air jostling is still not very good. Players just attach themselves to one another, and any attempts to muscle the other player off the ball are fruitless unless there is a massive strength discrepancy, like Rio Ferdinand vs. Andrei Arshavin. This is one area – probably the only one – where I’d recommend Konami take a note from EA Sports. Also, the refereeing is so bad, it’s completely unpredictable. I don’t like it when referees are too good, and catch everything; I like seeing the oddball mistake in my officiating, it makes things more realistic. But there is absolutely no rhyme or reason to anything called in Pro Evolution Soccer ’11, at all. There are times players will get the ball on a standing challenge and not only get a foul, but a card. There will be times players slide in early on the ball, catch nothing but player, and get away scot free. There will be times when players make a perfect sliding tackle, get ball, and get called for a foul. There will be times players come in and take someone’s legs out completely, hurt the other player, and get nothing. I wouldn’t even say this is Uriah Rennie-bad (like I joked about when I edited Mohamed’s review). Uriah Rennie was at least consistent, even if he was consistently like a prison warden with his use of cards. I have no freaking idea which way calls are going in this game, and I’m not even sure it’s patchable. With that said, there are other good bits, which all override the bad. There is finally full 360 degree dribbling, like FIFA’s had for a couple of years, and it’s tied to some other improvements. 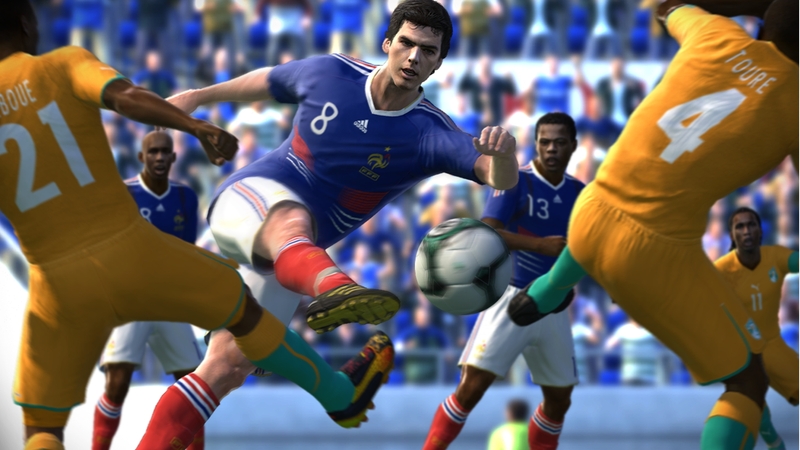 The 360 degree dribbling was made possible by improvements to the animations that make player movements more intuitive and seamless, and also has the effect of successfully nerfing game-breaking runs. Even on Top Player, over the years, the proper way to win in PES was to dribble at an angle – we’ll say 45 or 75 degrees – and then turn on the jets going 90 degrees. That’s not really possible anymore because the game’s been smoothed out, which makes this a much more delightful experience. Between the dribbling, the passing changes and the changes to defence, Pro Evolution Soccer is a completely different game than in years past, despite looking, sounding and even feeling the same, and in about 85% of the case, it’s a change for the better. To go back to my girlfriend analogy from the beginning of the review, it’s like the prude you started dating in high school left for a few years, started seeing other people, then came back to you with a few new tricks in the bag that both surprise and delight you. There is one consequence to all of these changes if you like to play both games like I do: going back and forth screws you up. This has always been the case to an extent, but now it’s REALLY the case, even if you use the same control scheme in both games. It’s much harder, especially, to go from FIFA to Pro Evo because it’s the latter game that changed the most, but either way, just due to the different way that each game plays, there’s always going to be an adjustment period whenever you go back and forth. The animations also address the biggest problem I had with the graphics from last year. Now, the game looks smooth, and in addition, it’s one of the best looking games on the market in terms of player models and textures. Watching the game in replay modes or via screenshots will drop your jaw, and in my mind, only 2K11 is better, or even comparable. Sound-wise, everything on the pitch works like it should. Sound effects are good, if a bit muted, but this is somewhat offset by the announcers, who are absolutely ATROCIOUS. They say nothing interesting, even by football standards, and oftentimes their calls – especially those by Jim Beglin, who replaced Mark Lawrenson – are just flat-out wrong. If a shot whizzes just past the post, a shot that would have surely beaten a goalkeeper if it was a foot to the side, you’ll surely hear about what a horrible shot it was, but shots that threaten the corner flag “just” miss. The only thing I can remember as being witty is when players come together for a scuffle and Jon Champion remarks that the handbags would be next to come out, but this was more witty when they first started saying it five years ago. The commentary MUST be redone, because it actively takes away from the game. With that said, it is INFINITELY cool that among the things that can be unlocked in the game’s menus are sounds from classic Konami games, from Frogger all the way to the obscure Japanese game/mash-up Wai Wai World. They’re not cheap – it’s going to take a bit of time to acquire 200 points at first – but if you grew up on Konami games, it’s a huge addition, and only adds to the geek factor for a game that largely made its name on geeks. If you didn’t grow up with Konami games, this won’t mean a lot to you, but I did, and I spent the first few hours after unlocking the Castlevania sounds visibly giddy. There are other things to unlock, from different novelty balls (including barrels and hard candy pieces) to classic players and teams, to boosts for Be a Legend and Master League, to even different stadium parts for editing and creating stadiums. Among those are fences, stands and even backdrops from classic games. You have not lived until you have played a game with Dracula’s castle from Castlevania in the background of a football match. Most notable among all this? 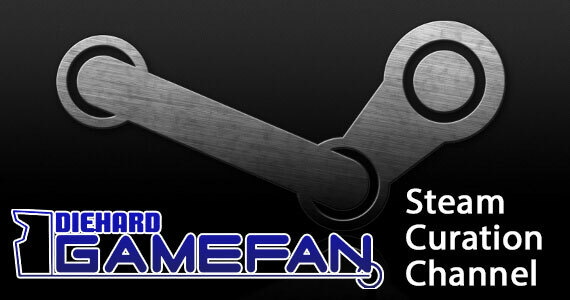 They’re only unlockable via in-game currency, which you have to earn in-game. This is where we are as a gaming society in 2010: the fact that I’m celebrating the fact that Konami did NOT allow their goodies to be purchased via real-world money, and instead make gamers earn it like in the old days. God, I love Konami so freaking much right now. 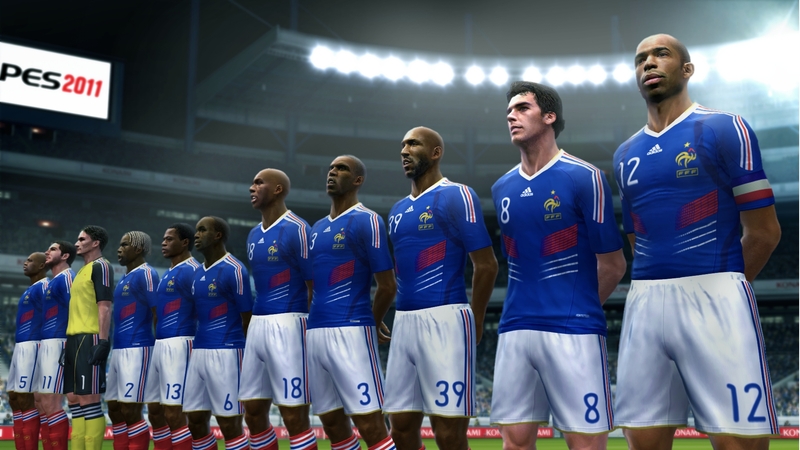 In terms of online play, PES ’11 is unspectacular. They offer an online master league, but it’s chopped down from what you would find in the single player version; it’s just there to be comparable to some of EA’s other options. However, the games I played were lag-free and didn’t crash me out, which is something I couldn’t say about EA’s exceptionally unsteady servers. I think I lost more to EA than I did to actual humans. With PES, not only is it reliable, but I was able to have very competitive games where games weren’t able to be won or lost by exploiting glitches or the AI. I’m not a big online player – in fact, I abhor it – but playing in Pro Evo didn’t make me want to tear my hair out, at least. That’s more than can be said for not only FIFA, but every other EA Sports game this year (why hello there, Mr. Wraparound Bug in NHL ’11. Oh no, have a seat. It’s OK, you don’t have to leave, it’s only November). It’s good to have my girl back. After a few years of missteps, Konami finally found their smile, and put one back on my face. 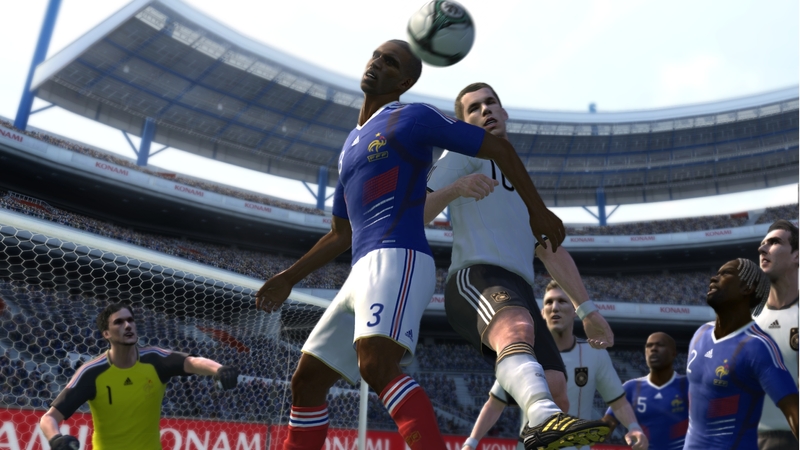 Pro Evolution Soccer 2011 isn’t for everyone, but that’s not really a problem because it never really has been for everyone. The people that like this series will come back in droves for the gameplay changes, for the little touches, and simply for the fact that it’s Not FIFA. For the first time since I can really remember, it’s a toss up as to what the better football game is. It really is a matter of personal preference. FIFA ’11 has all the things that make technically “better” football games, but is a mess when it comes to actually using the package. PES is going to require an adjustment, but once you do, there’s a brilliant football game to be had. 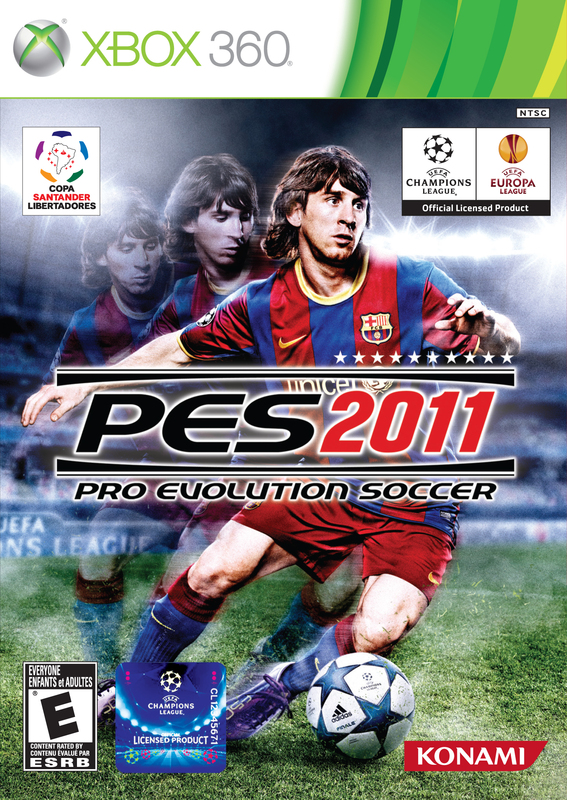 My vote goes to Pro Evolution Soccer ’11. Welcome home, baby.